Far and away the largest contribution made by Canadian women to the war effort came through their unpaid labour in the home and in “volunteer” work. 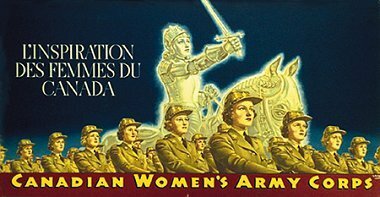 Almost immediately after Canada’s entry into the war, women across Canada took the initiative, founding organizations to coordinate women’s volunteer war work. Only in September 1942 did Ottawa step in and take over the direction of this work, appropriating a name already in use in Ontario—Women’s Voluntary Services. The federal WVS introduced a Block Plan in the larger urban centres to organize house-to-house canvassing and collection. 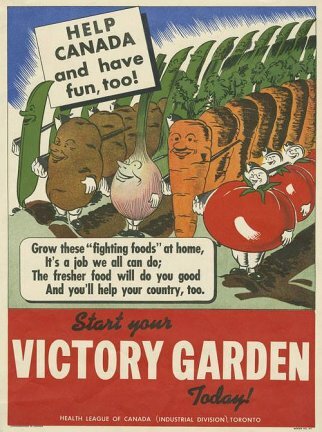 Local WVS centres participated in a wide range of national programs, distributing ration cards, recruiting and training volunteer staff in wartime day nurseries, promoting the sale of war bonds and encouraging the sewing, knitting, quilting and packing of “ditty bags” for the servicemen and women overseas. 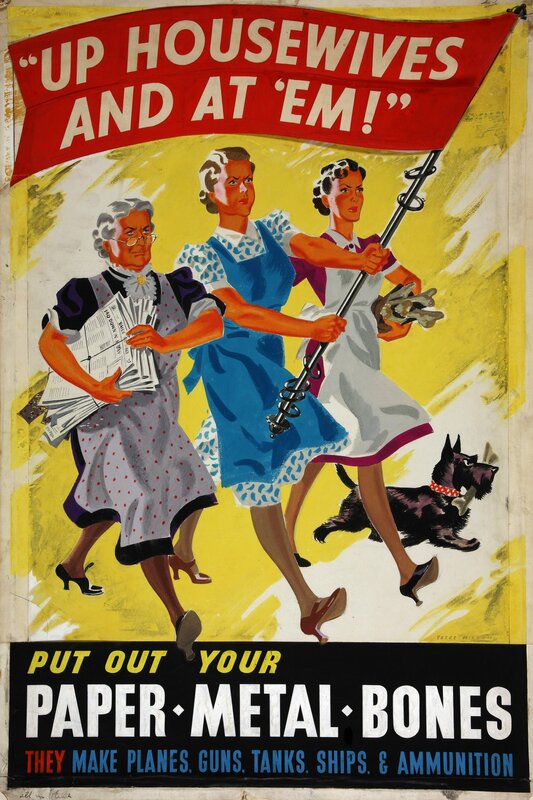 As homemakers, women were called upon to abide by and enforce rationing, prevent waste and save and collect materials that could be recycled for use in war production. As one poster put it, women were to “Dig In and Dig Out the Scrap”—metals, rags, bones, rubber and glass. In the countryside Women’s Institutes helped farmers’ wives and daughters who took over work on the land in the absence of husbands and fathers. These women drove tractors, made hay, picked fruit, raised gardens and increased the country’s poultry and egg production. In September 1939, Canada, still recovering from the Depression, had approximately 900,000 registered unemployed. For the first two years of war, these workers met war production’s increased demand for labour, but by 1942 that reserve was exhausted. When Prime Minster Mackenzie King established the National Selective Service in March 1942, he declared recruitment of women for employment to be “the most important single factor of the program.” In May of that year, the Women’s Division of NSS was created and Mrs. Rex (Fraudena) Eaton of Vancouver was put in charge. For as long as possible, her office aimed their recruitment efforts exclusively at young unmarried women, but by June 1943 that labour pool, too, had evaporated. Gradually the target was widened to childless housewives for part-time work, next married women without children for full-time work, then married women with young children for part-time work, and finally mothers of young children for full-time work. In anticipation of this development, the federal Minister of Labour was empowered by Order-in-Council to enter into agreements with provinces for the establishment of day-care facilities for children of mothers employed in war industries. Only the most industrialized provinces took advantage of the Dominion-Provincial Wartime Day Nurseries Agreement—Ontario and Quebec. This first foray by the Canadian state into government-supported childcare remained short-lived and small in scale, accommodating at its height only around 2,500 children in Ontario and 115 to 120 in Quebec. Moreover, the program, introduced to aid mothers working in war industries, strictly limited the places for the children of women working in other sectors to 25% of capacity. Practically the moment the war was over, Quebec’s Wartime Day Nurseries closed their doors; Ontario’s stayed open only to the spring of 1946. The third sector in which women served the war effort was the Armed Forces. Faced with a manpower shortage as early as June 1940, National Defence Headquarters began looking into the possibility of employing uniformed women to release men for active service. 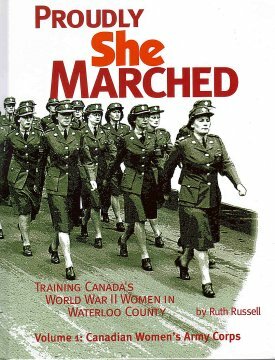 The interests of NDHQ coincided with the keen desire of thousands of Canadian women already organized into volunteer women’s service corps and petitioning the government for the right to serve their country in uniform. 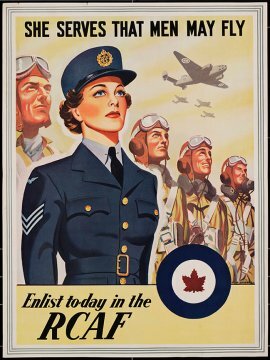 Between July 1941 and March 1942, all three services opened their doors to women (beyond nursing sisters): the Air Force in July 1941; the Army in August of that year, fully integrating the Canadian Women’s Army Corps in March 1942; and the Navy in July 1942. 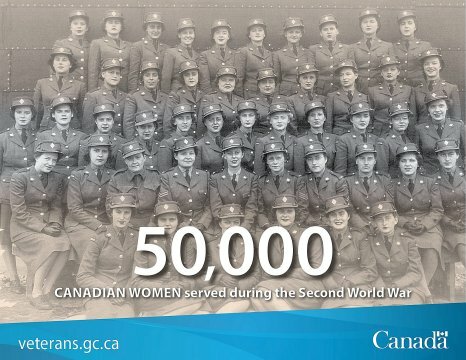 By war’s end, almost 50,000 women had served in one of the three women’s services: the Royal Canadian Air Force (Women’s Division), commonly called the WDs; the CWAC; and the Women’s Royal Canadian Naval Service (WRCNS). The number of occupations open to women in the Forces increased during the war, but all three services primarily used servicewomen in support jobs to release men for combat duty. The mottoes of the women’s services tell the story: We Serve That Men May Fly; We Serve That Men May Fight; We Are the Women Behind the Men Behind the Guns. A few female personnel were assigned to operational duties with coastal defence units as kinetheodolite operators and in gun operations rooms as broadcasters and plotter-telephonists. The secretary in uniform remained the typical servicewoman. 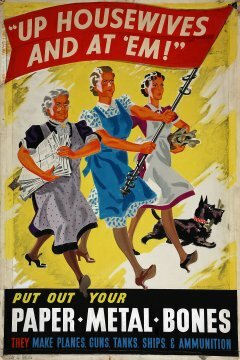 The initial pay rate for servicewomen was set at two-thirds of that for men, but in response to a public outcry led by the National Council of Women, basic pay was raised in July 1943 to 80% of the pay of men of the same rank, and for the first time allowances were to be paid to the dependants of servicewomen (parents, brothers and sisters, but not husbands). Those involved in recruiting women for war work in the civilian labour market also sought to allay fears that women doing jobs formerly performed by men were not upsetting the basic gender order. For instance, it was argued that women’s “natural” endowments of “dexterity, patience and keen eyesight” made them eminently suitable for the “deft-fingered” precision work required at various stages of aircraft, gun and ammunition manufacture, especially in electronics and optics. Such “feminization” and “domestication” of women’s war work was vividly captured in a newspaper photo showing a woman factory worker laying out rows of igniter caps for smoke cartridges as if they were cookies on a baking sheet. In June 1943, journalist Lotta Dempsey, covering the ceremonial launching of a ship women war workers had helped to build, hailed the event as symbolizing “the great and final movement of women into industry…on a complete equality with men.” Not all contemporary observers shared Dempsey’s optimistic view. In retrospect, one can see the measures taken by politicians and policy makers in business, labour and the military to contain the apparent emancipatory changes for women. Employing married women (with or without children) outside the home was intended only “for the duration” of the war emergency. 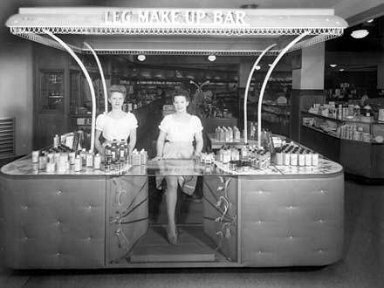 Long before war’s end, post-war planners were laying the groundwork for training policies designed to return married women to the home and single women in need of employment into domestic service. With the evaporation of the labour shortage, preference for jobs was given to ex-servicemen. Barriers to married women’s employment dropped back into place. 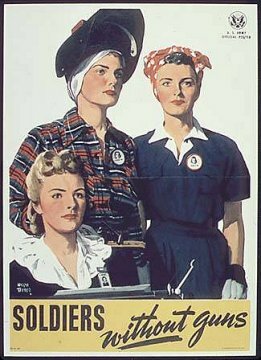 During 1946, the Armed Forces disbanded all three women’s services. What survived, however, were those pictures of women wearing bandanas and pants while handling riveters and blowtorches or sitting in uniform behind the wheel of a jeep. And these images would one day inspire a succeeding generation of women, those who launched in the 1960s the so-called second wave of feminism. 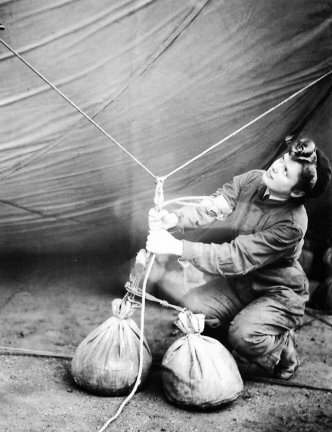 British female military auxiliaries handle a barrage balloon ~ Incendiary sock unit Between 1942 and 1944, the British Royal Air Force and Royal Navy frequently got to bickering over a certain issue. It was, oddly enough, to do with a program pushed by the Royal Navy’s Captain Gerald C. Banister, Director of Boom Defense to use free-flying, eight foot wide, hydrogen-filled balloons to sabotage German infrastructure. The RAF was often concerned about the balloons interfering with their air operations and rightly so. 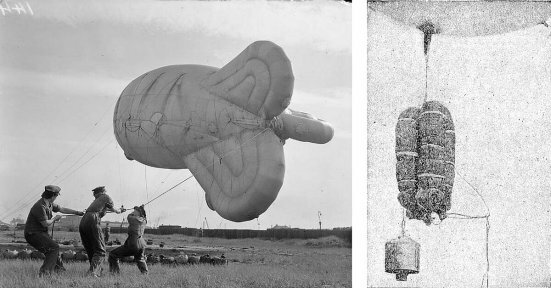 The German Luftwaffe was endlessly harassed by these simple devices and to the Admiralty and British Chief of Staff, that alone was worth the small cost for deploying these balloons. And the toll on German infrastructure, forests and farmland was greatly more lucrative to the British war effort. Mind you, there were also some pretty monumental accidents with the program, but for the most part, these relatively cheap, clever and amusing little devices were a delightfully successful tool in the British arsenal. It was Operation Outward. The lightbulb of this idea first clicked on with the Air Vice Marshal of the Balloon Command, who oversaw barrage balloon operations intended to defend against low-flying Luftwaffe bombers. It was suggested to launch balloons that would fly into German territory using radio trackers and triangulation to follow their course. The idea was initially turned down as, well, silly. But after a monstrous storm in mid-September 1940, when several barrage balloons came loose, drifted over the North Sea and reaped havoc on electrical infrastructure in Sweden and Denmark, Prime Minister Winston Churchill asked that the strategic value of balloon attacks on Germany be assessed. The Air Ministry once again deemed the whole idea rather silly and shot it down (so to say). Captain Banister pushed the idea through the Admiralty, however, and after studying the factors carefully, they decided the idea was brilliant. Here’s what they found: In studying meteorological concerns, they discovered that the winds above 16,000 ft (needed for such devices to float the distance and direction from Britain to Germany) almost always went West to East, meaning the Germans couldn’t retaliate in kind. Also, the whole apparatus of the balloons and their sabotage devices were not only relatively cheap (about £85 at current day equivalent), but could be made almost exclusively with surplus materials. The rigged-up balloons themselves were designed thoroughly and with great imagination. 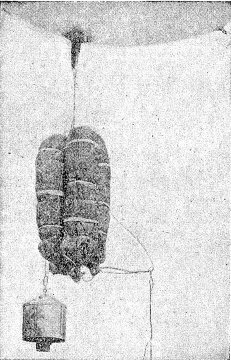 Inside surplus eight-foot wide latex weather balloons filled with hydrogen, the Navy inserted a wire so that as the balloon rose and continued to expand it would tighten the cable and stop the ascent at 25,000 ft. (7,600 m). They also added a slow-burning fuse that was calibrated, using calculated arrival time over Germany, to activate a slow drip from a can of mineral oil to lighten the balloon’s load and slow its decent. The same slow-burning fuse was also rigged to the balloons’ weapons. These weapons came in two forms: wires and incendiaries. When the fuse triggered the wire apparatus, the balloon would drop a 300 ft (91 m), 1.8mm diameter steel wire at the end of a 700 ft (210 m) hemp cord. The wire would then trail below the balloon until it (with any luck) struck German power lines, shorting out the lines and damaging electrical infrastructure to a great degree. These worked to varying success but certainly succeeded quite frequently. The incendiary devices came in several forms and were intended to ignite forests and fields. One design was a metal canister which contained seven or eight half-pint bottles filled with white phosphorus, benzene, and a strip of rubber which would melt inside. When the fuse activated the device, it would tip over and drop the bottles which would shatter and ignite. The second kind of device was simply a metal imperial gallon container filled with jelly that would ignite into a 20 ft fireball. And then there was the incendiary sock, a tube filled with wood wool and coated in wax which, when dropped, formed a V shape to get it stuck in a tree where it would then burn down over 15 minutes, hopefully catching the forest ablaze. Luckily, the Royal Navy already had about 10,000 of these things just lying around. The first launch site for Operation Outward was a golf club in Suffolk in Britain’s Southeast. Over 200 officers and non-commissioned men and women from the Royal Marines and Women’s Royal Naval Service, under the command of Boom Defense were responsible for lofting these little gifts to Germany into the air on days with favorable weather. They had to coordinate with the Air Ministry, as well, to avoid damaging British aircraft, which led to the bickering first mentioned. Between March 20th, 1942 and September 4th, 1944, Operation Outward launched 99,142 balloons, sometimes as much as 1,800 over the course of a few hours. The results were spectacular, probably bringing cheeky grins to many faces in the Admiralty. The first indication of success was chatter heard in Luftwaffe communications of German pilots chasing down these devilish balloons. The cost of fuel and wear and tear to their aircraft was already far outweighing the cost the Royal Navy put into the program. Throughout the remainder of the war, intelligence and various news articles in occupied areas like France and Denmark provided some reports of forest and farm fires and many power outages caused by shorted wires in Germany. The personnel and material needed to attend to these situations were far from negligible. After the war, a report studying German records concluded the damage done by Operation Outward was, at the very least, £1.5 million worth (or £49 million in 2016). Of course, records were both incomplete and not even available from the Russian occupied zone. Highlights and glaring mistakes from Operation Outward include: when a wire balloon hit an 110,00-volt line near Leipzig, Germany in July 1942 causing a transformer failure at the Böhlen power station which then burned to the ground. On the other side, one balloon got caught by a wind and headed for England and knocked out power in the town of Ipswich. In a grave incident the night of September 19th, 1944, one balloon drifting over Sweden caused two trains to crash at Laholm. 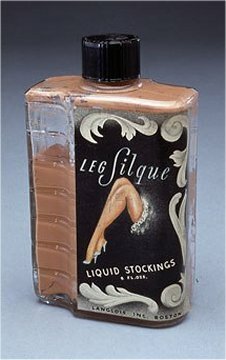 You may have seen or read about ladies painting on their stockings during the second world war. If you have, you may have also wondered why on earth they would do this and how they would get the seams up the back of their legs, never mind how they got them straight. Read on to find out more about this interesting trend, brought on through necessity by World War II. 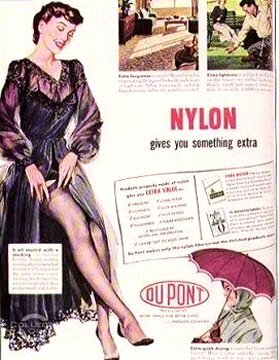 In 1939 Dupont started to manufacture nylon stockings, which was revolutionary at the time as hosiery had previously been made from silk. These new stockings were incredibly popular with women, who rushed to stores to snap up as many pairs as they could afford. 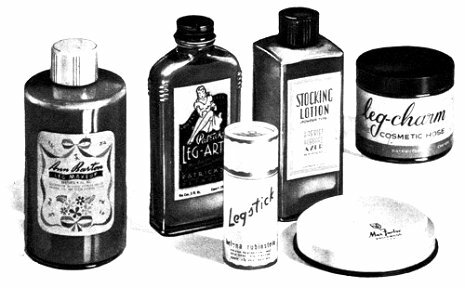 Up to 4 million stockings were sold each day throughout America and Dupont struggled to keep up with demand. However, disaster struck when the second world war broke out and nylon needed to be utilised for the wartime effort, equipment such as parachutes and ropes were made from nylon and were of course prioritised over hosiery. “Rationing was mandated by the each country’s government, and was embraced and carried out by citizens the world over.” – Meghann Mason, University of Nevada, Las Vegas. 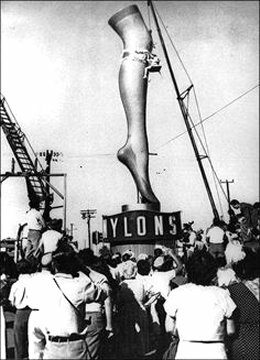 America entered into the war in December of 1941 by which time, nylon stockings had become very fashionable and sought after. Although it may seem ridiculous to us nowadays, stockings back then were extremely important, women would not venture outside of their home without hosiery adorned legs, it would have been considered indecent! 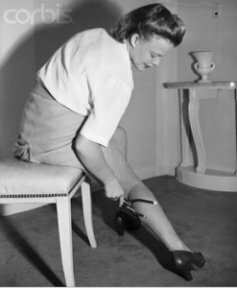 When the war broke out, stockings were bought and sold on the black market and many people resorted to theft in order to get hold of a pair of precious nylon stockings. For the ladies who were not criminally inclined, they needed to find a solution to the stockings shortage, and fast! However, it didn’t end there. 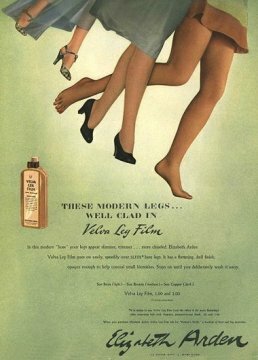 Ladies who were keen to wear a faux seam up the back of their legs needed to become adept at drawing straight lines from their heel to their thighs (usually with eyebrow pencils); some ladies even drew on the design of the stocking heel! If you think putting on stockings can be infuriating, imagine trying to draw two perfectly straight lines up the back of your legs in the morning! Some women would have (understandably) struggled with the application of the seams and came up with ingenious contraptions to help themselves, below is is an image of Kay Bensel with her new gadget! 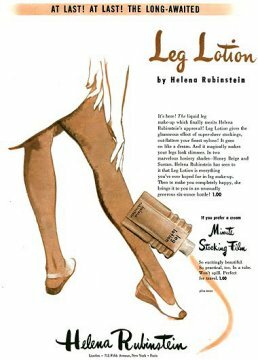 Another option would be to go to salons and have other ladies apply the liquid stockings to your legs themselves! So when you’re struggling with putting on your own stockings and cursing at not being able to get the seams straight, spare a thought for these poor ladies. 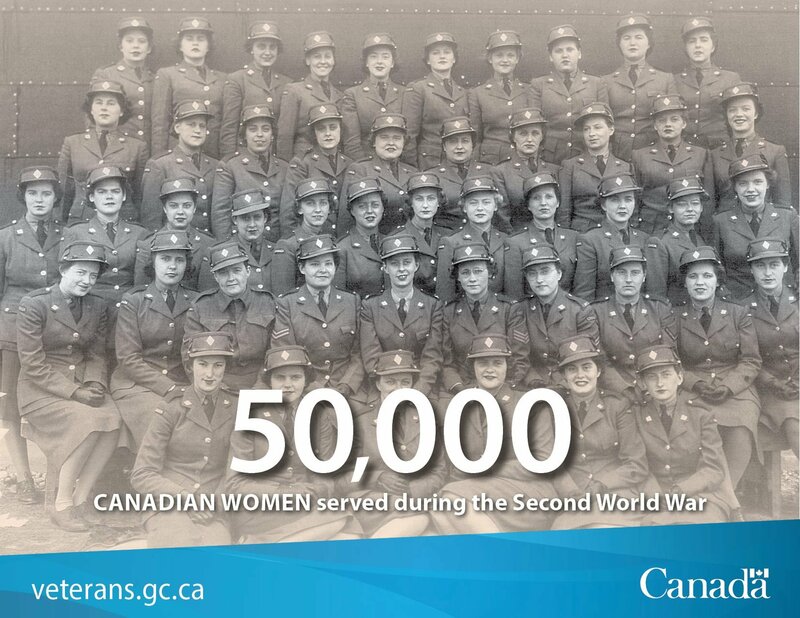 The Second World War saw more than one million Canadians serve in uniform. Women’s Royal Canadian Naval Service (WRCNS). many of them served overseas within reach of enemy attack.